Providing workplace orientation and continuing education for all Corning employees worldwide, this facility occupies a renovated 5-story structure at the corner of Corning’s historic main street and the entrance to Corning Incorporated’s headquarters. The classrooms and conference facilities are equipped with the most current data and A/V infrastructure to accommodate a wide range of configurations for learning environments and global connectivity. The new building entrance and 4-story lobby create a strong axial connection with Corning headquarters’ front door. Corning Incorporated has a long history that is integral to the town from which it took its name. As the primary employer, and with a campus that contributes fundamentally to the townscape, Corning Inc.’s identity is strongly tied to its location. The company has a long and critical role in sustaining and promoting the educational, mercantile, and cultural life of the town. Hence when they decided to create their primary orientation and learning center for all employees, the choice of location reflected this close link to the greater community. Situated on the corner of the town of Corning’s “Main Street” and the cross street that leads to the corporate headquarters' front door, the Learning Center bridges between the company and town. To reinforce this critical location and set of relationships, D. W. Arthur Associates’ design for the facility employed a number of strategies. First, the main entrance to the Learning Center was located facing, and directly on axis with the corporate headquarters’ main entrance. Between the two, and reinforcing this axis, is an entrance gate originally located at the entrance to the main glass factory, which is lined with examples of early art glass tiles. Addressing potential public concern around a private building occupying this prominent location, a 4-story atrium spanning the width of the existing building and connecting to Main Street was created. The resultant grand space is glazed invitingly on three sides, and accommodates art and other installations as well as gatherings. The transparency of this “great room” conveys openness and forms a visual bridge between Main Street and the corporate heqdquarters. Since much of the education and training that occurs in the numerous classrooms is highly proprietary, a display system was inserted at the ground floor windows, providing adequate visual privacy for the classrooms while also animating the building’s street. The system is an installation of art glass pieces from the Museum of Glass located a couple of miles away. 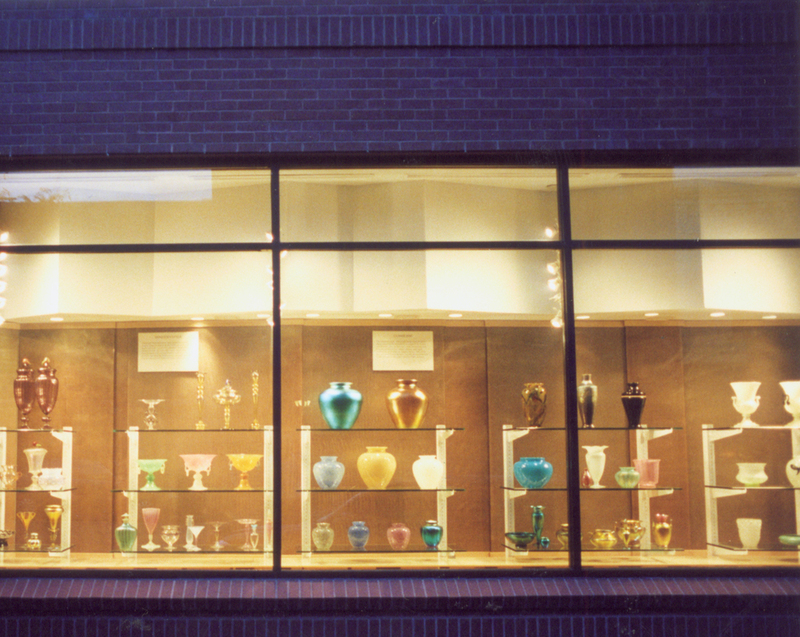 This art glass was created by Frederick Carder, the founder of Steuben Glass Works, which later became Corning Inc. As a backdrop to these individual pieces, D. W. Arthur Associates developed an undulating screen of custom “obscure” glass comprised of several layers of different glass laminated over a copper screen. This screen provides adequate privacy, admits daylight to rooms beyond, and comprises a beautiful backdrop to the Carder pieces, echoing their manifold optical qualities with the shimmering and diffuse copper scrim.